Key Message: Neuropathic pain, occurs frequently after a peripheral nerve or brachial plexus injury. The mechanisms responsible for its generation include peripheral nociceptor sensitization, peripheral ectopic discharges, central sensitization with changes in the dorsal horn of the spinal cord, and cortical reorganization. The treatment must be multidisciplinary, starting with pharmacological and non-pharmacological measures and including a wide variety of surgical options. The latter include a primary nerve repair, dorsal root entry zone lesioning for avulsion pain, spinal cord stimulation for non-avulsion neuropathic pain, and modulation by peripheral nerve stimulators. In refractory cases, deep brain and cortical stimulation may be used. Managing nerve injury-associated pain is complex and requires multidisciplinary teams of trained personnel to achieve satisfactory pain relief and a good quality of life, and to facilitate rehabilitation of the patient into the work force. Treatment should be initiated early and be both aggressive and progressive, beginning with drugs like tricyclic antidepressants and calcium channel ligands, combined with non-pharmacological therapies like physiotherapy, occupational therapy, interventional procedures, neurostimulation, and psychotherapy. In those patients with very severe or treatment-refractory pain, neurosurgical options must be considered. The primary aims of the current paper are to describe and analyze scenarios associated with pain as a result of peripheral nerve and plexus injuries, the pathophysiological mechanisms behind them, and the various therapeutic options that are available. Some patients with C5 avulsion describe the shoulder pain. With C6 lesions, the pain is predominantly perceived in the thumb and index finger; while, with C7, C8 and T1 avulsions, the pain radiates from the elbow to the hand and is difficult to specifically localize.,, The pain usually worsens with climate changes and improves during social events and recreational activities. Chronic regional pain syndrome (CRPS) may be difficult to distinguish from chronic neuropathic pain. Both may have a sudden-onset burning and dysesthesia, and a distal distribution. However, the latter also may be associated with an excessive autonomic response, which can include sudden color changes in the affected limb; increased sweating followed by abrupt skin pallor and coldness; and, trophic disturbances involving the skin, hair and nails. A further distinctive characteristic is extreme sensitivity in the limb, to the point where the patient will withdraw it from even the slightest, lightest touch, even when distracted by the examiner. Nociceptors are peripheral receptors localized in the free endings of type C unmyelinated fibers and type A delta myelinic fibers. Sensitization is a special feature of nociceptors, which involves an increased excitability of the receptor. This in turn induces an increased responsiveness to nociceptive stimuli. For some authors, the hyperactive state of the spinal cord neurons, due to lack of inhibition caused by spinal cord structural changes, could explain the persistent pain, regardless of the initial peripheral mechanisms responsible for it.,,,,,,,, Others claim that the development of pain is mediated by non-avulsed roots, which could explain the improvement in pain observed after the primary, early root repair of brachial plexus injuries. Achieving adequate control of pain and its associated symptoms is the primary objective of treatment, along with trying to avoid psychological deterioration and mood changes, and preserving sleep., The management should be a staged process [Figure 2]. The mechanical allodynia observed in patients with neuropathic pain might be caused by an increase in type N calcium channels among the central terminations of dorsal horn afferent neurons. The efficacy of SNRIs in treating neuropathic pain, is independent of their antidepressant effects.,, The anti-depressants used most frequently are TCAs — especially amitriptyline or nortriptyline — due to their effect on sodium channels, and inhibition of noradrenalin and serotonin re-uptake. They also antagonize muscarinic, histaminergic and alpha-adrenergic receptors, which explains their diverse adverse effects, which include a dry mouth, cognitive alterations, constipation, urinary retention, sedation, weight gain, orthostatic hypotension, and QT interval prolongation.,, Contraindications to their use are closed-angle glaucoma, benign prostatic hypertrophy, and a history of myocardial infarction. As with the previously-mentioned drugs, low doses are recommended initially, often beginning with 10-25 mg at night to reduce the risk of daily sedation, followed by slowly increasing the dose, as needed.,, Effective analgesic doses generally are from 50 to 150 mg per day., An improved sleep, mood and anxiety are additional potential benefits of these drugs. Other antidepressants that may be used for the second-line treatment include other inhibitors of serotonin and noradrenalin re-uptake, like duloxetine and venlafaxin. Opioid use is generally only considered when patients with neuropathic pain experience no more than a very limited response to first-line drugs. However, they are a good choice for acute neuropathic pain.,, Tramadol, oxycodone and methadone are the opioids with the most published evidence supporting their efficacy in reducing neuropathic pain. Tramadol is both a mu opioid receptor agonist and inhibitor of serotonin and noradrenaline re-uptake. Oxycodone is the opioid with the most published clinical trials documenting its efficacy for neuropathic pain; as such, it is the drug listed in most clinical guidelines. Opioids act at different levels of the peripheral and central nervous system. At the supra-spinal level, they interact with mu receptors within the peri-aqueductal gray substance (PGS), where they block pain transmission. At the spinal level, opioids inhibit dorsal horn neuronal impulses evoked by C fibers and local interneurons. At the peripheral level, the local application of opioids can have an effect similar to local anesthetics in a high concentration. The most common adverse effects of opioid analgesics are nausea, constipation and sedation. It is recommended that the treatment starts with low doses, followed by a gradual upward or downward titration, as indicated, in association with laxatives and antiemetics. Tramadol has its own unique adverse effects, including seizures, and serotonin syndrome when combined with other SNRI-like antidepressants, monoamine oxidase inhibitors, antipsychotics, antiemetics and some analgesics., It also can trigger manic episodes in patients with a bipolar disorder. Patches and lotions containing lidocaine for topical application can reduce hyperalgesia and allodynia by acting upon the sodium channels over-expressed at the injured peripheral nerve endings. As systemic absorption is minimal with this route of administration, the likelihood of adverse effects is low, the most frequent undesirable effect being mild local skin reaction. Capsaicin is an alkaloid derived from hot chili peppers that interacts with transient receptor potential cation channel subfamily V member 1 (TRPV1) receptors at the endings of type C fibers, producing desensitization to chemical, mechanical and thermal stimuli, and, thereby, reducing pain transmission to the central nervous system. Capsaicin and lidocaine are indicated as adjuvant therapies for patients with neuropathic pain, experiencing significant levels of dysesthesia, hyperalgesia and/or allodynia., Local anesthetics also can be very useful for administering of nerve blocks. There are four basic options for the surgical management of neuropathic pain: decompression, reconstruction, ablation and modulation. The aim of decompressive procedures is to relieve peripheral nerves or roots from compression caused by the scar tissue, ligaments, tendons or tumors. Reconstructive techniques attempt to restore functional connectivity between the peripheral and central nervous system. Such reconstruction can be achieved directly by joining two damaged nerve endings or by performing nerve transfers. Both of these techniques can be performed with or without the use of nerve grafts. The ablative procedures include neurectomies, dorsal rhizotomy, dorsal ganglionectomy and dorsal root entry zone (DREZ) lesioning. Lastly, neuromodulation techniques seek to modify afferent or efferent neural pathways by administering either electrical stimuli (stimulators) or drugs (intrathecal pumps). Lesioning of the dorsal root entry zone (DREZ) is the method of choice to treat pain from brachial plexus root avulsions that fails to respond to pharmacological treatment and primary nerve repair.,,,,,,, It is based on the concept of interrupting dorsal horn ascending pathways.,,,,,,, This procedure is effective at relieving pain in 70 to 90% of patients,,,,,,,, being particularly effective at reducing the paroxysmal component of avulsion pain. Post intervention, pain may gradually reappears. However, according to several authors, 50 to 70% of patients report the presence of continued analgesia on a long-term basis.,,, Among patients in whom the pain does recur, it usually is of tolerable intensity (approximately 20% of the original level of pain intensity) and is controllable with appropriate drugs. Peripheral nerve stimulation achieves neuromodulation via implantation of a device directly onto the affected nerve, producing an electrical current to reduce pain. The success rate of this approach ranges from 70 to 80% when treating post-surgical nerve lesions, injection injuries, and refractory compressive neuropathies.,, Between 10 and 15% of patients experience some mild complication like a wound infection or electrode migration,,, though some patients report undesirable muscular contractions as a result of repeated nerve stimulation. The use of this approach is not universally accepted, despite its having existed for many years and being a documented effective option for isolated nerve injuries. Spinal cord stimulation might act via the gate control theory of pain proposed by Melzack and Wall in 1965, but its true mechanism of action is not completely known. The procedure entails implanting electrodes within the posterior epidural space, at the cervical or dorsal spinal cord level, that in turn are connected to an impulse generator., The indications for such a device include painful nerve lesions refractory to other treatments.,, However, when complete root avulsion occurs, this approach generally is relatively ineffective due to the degeneration of target fibers up to the brainstem.,,,, This method is an option for pain due to non-avulsive brachial plexus injury, and could be an option in those patients with persisting pain despite the performance of DREZ lesioning. This procedure is reserved for those patients with neuropathic pain that fails to respond to any other form of treatment, amongst whom the reported success rates range from 36 to 45%., This approach also might be a good option as an adjuvant treatment in those patients with persistence of the continuous component of the avulsion pain after the DREZ lesioning. In such patients, improvement could be related to cortical modulation of structures within the thalamus and cingulum that play an important role in maintaining the continuous component of avulsion pain. Another hypothesis is that pain relief after cortical modulation is a response to the cortical activation of structures within the anti-descending nociceptive system. Neuropathic pain is very frequent among patients with a peripheral nerve or brachial plexus injury, with an incidence ranging from 67 to 95% overall, and from 80 to 90% when root avulsion has occurred. Several mechanisms are involved in the generation of neuropathic pain, including peripheral nociceptor sensitization, peripheral ectopic discharges, central sensitization with changes in the dorsal horn of the spinal cord, and cortical reorganization. The treatment must be multidisciplinary, starting with pharmacological measures (TCA, calcium channel inhibitors) in combination with non-pharmacological strategies like the use of TENS, topical agents, and physiotherapy, among others. A wide variety of surgical options exist. 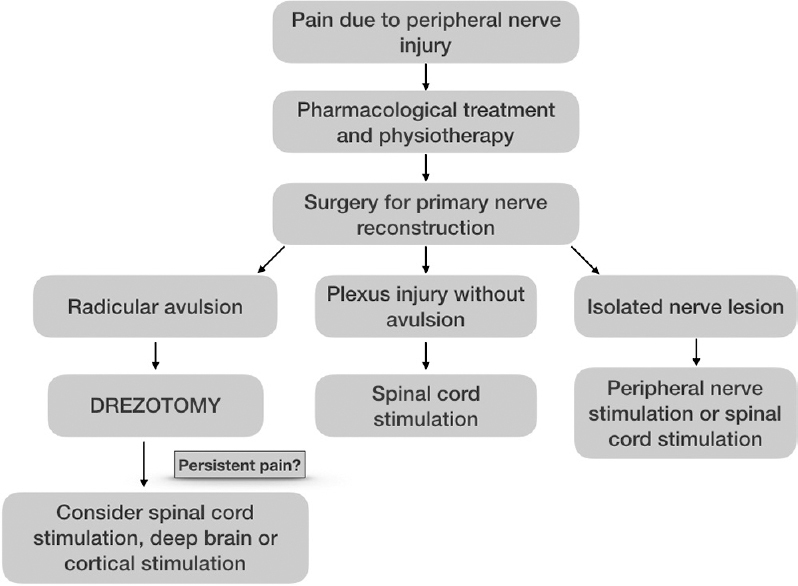 However, the most widely-used and accepted are primary nerve repair, DREZ lesioning for avulsion pain, spinal cord stimulation for non-avulsion neuropathic pain, and modulation by peripheral nerve stimulators. In refractory cases, other available options include deep brain and cortical stimulation. Siqueira MG, Malessy MJA. Lesiones traumáticas del plexo braquial: Aspectos clínicos y quirúrgicos en: Introducción a la cirugía de los nervios periféricos. Socolovsky M, Siqueira MG, Malessy MJA (eds). Journal, Buenos Aires, Argentina. 2013. Cap 12;121-36. Simon NG, Franz CK, Gupta N, Alden T, Kliot M. Central adaptation following brachial plexus injury. World Neurosurg 2016;85;325-32. Wynn Parry CB. Pain in avulsion lesions of the brachial plexus. Pain 1980;9;41-53. Vannier J, Belkheyar Z, Oberlin C, Montravers P. Management of neuropathic pain after brachial plexus injury in adult patients: A report of 60 cases. Annales Françaises d'Anesthesie et de Reanimation 2008;27:890-5. Carvalho GA, Nikkhah G, Samii M. Treatment of pain following traumatic lesions of the brachial plexus. Orthopäde 1997;26:621-5. Teixeira MJ, da Paz MG, Bina M T, Santos SN, Raicher I, Galhardoni R. Neuropathic pain after brachial plexus avulsion-central and peripheral mechanisms. BMC Neurol 2015;15;73. Bertelli JA, Ghizoni MF. Pain after avulsion injuries and complete palsy of the brachial plexus: The possible role of nonavulsed roots in pain generation. Neurosurgery 2008;62:1104-14. Samii M, Bear-Henney S, Lüdemann W, Tatagiba M, Blömer U. Treatment of refractory pain after brachial plexus avulsion with dorsal root entry zone lesions. Neurosurgery 2001;48:1269-77. Zheng Z, Hu Y, Tao W, Zhang X, Li Y: Dorsal root entry zone lesions for phantom limb pain with brachial plexus avulsion: A study of pain and phantom limb sensation. Stereotact Funct Neurosurg 2009;87:249-55. Sindou MP, Blondet E, Emery E, Mertens P. Microsurgical lesioning in the dorsal root entry zone for pain due to brachial plexus avulsion: A prospective series of 55 patients. J Neurosurg 2005;102;1018-28. Bentley JN, Kashlan ON, Sagher O. Stump, phantom and avulsion pain. In: Burchiel KJ (editor). Surgical Management of Pain. New York, Thieme, New York. 2nd edition. 2015:229-37. Dorsi MJ, Belzberg AJ. Dolor por lesión de los nervios periféricos. In: Socolovsky M, Siqueira MG, Malessy MJA (editors). Introducción a la cirugía de los nervios periféricos. Journal, CABA, Argentina. 2013. p.205-17. Nickel FT, Seifert F, Lanz S, Meihofner C. Mechanisms of neuropathic pain. European Neuropsychopharmacology 2012;22:81-91. Quintao NLM, Santos ARS, Campos MM, Calixto JB. The role of neurotrophic factors in genesis and maintenance of mechanical hypernociception after brachial plexus avulsion in mice. Pain 2008;136:125-33. Lenz FA. Neurosurgical treatment of pain. In: Cervero F, Jensen T (editors). Handbook of Clinical Neurology. Pain. Amsterdam, Elsevier. 2006; Vol 81:p.869-85. Berman JS, Birch R, Anand P. Pain following brachial plexus injury with spinal cord root avulsion and the effect of surgery. Pain 1998;75;199-207. Bonilla G, Di Masi G, Battaglia D, Socolovsky M. Medición, clasificación y evolución del dolor provocado por las lesiones nerviosas periféricas traumáticas antes y después de la cirugía de reparación nerviosa. Rev Argent Neurocir 2009;23:49-54. Woolf CJ. Dissecting out mechanisms responsible for peripheral neuropathic pain: Implications for diagnosis and therapy. Life Sciences 2004;74:2605-10. Chivukula S, Tempel ZJ, Chen C-J, Shin SS, Gande AV, Moossy JJ. Spinal and nucleus caudalis dorsal root entry zone lesioning for chronic pain: Efficacy and outcomes. World Neurosurg 2015;84:494-504. Wall PD, Lidierth M, Hillman P. Brief and prolonged effects of Lissauer tract stimulation on dorsal horn cells. Pain 1999;83:579-89. Rivera Canudas MV. Control farmacológico del dolor neuropático. In: Farmacoterapia para el control del dolor: pautas de uso. Reunión de expertos. Cátedra extraordinaria del Dolor “Fundación Grünenthal” de la universidad de Salamanca 2008. p.63-71. Mathews M. Multimodal treatment of pain. Neurosurg Clin N Am 2014;25:803-8. Rodríguez López MJ: Actualizaciones en dolor neuropático. In: Actualizaciones en el control del dolor: 10 años. Reunión de expertos. Cátedra extraordinaria del Dolor “Fundación Grünenthal” de la universidad de Salamanca 2010. p.87-100. van Dongen R, Cohen SP, van Kleef M, Mekhail N, Huygen F. 22. Traumatic Plexus Lesion. Pain Practice 2011;11:414-20. Walk D, Backonja MM: Painful neuropathies. In: Fishman SM, Ballantyne JC, Rathmell JP (editors). Bonica's management of pain. Philadelphia, Lippincott Williams and Wilkins. 4th edition. 2010. p.303-13. Yaksh TL, Wallace MS: Opioides, analgesia y tratamiento del dolor In: Brunton LL, Chabner BA, Knollmann BC (editors). Goodman and Gilman. Las bases farmacológicas de la terapéutica. México: Mc Graw Hill interamericana. 12th edition. 2012. p.481-525. Beakley BD, Kaye AM, Kaye AD. Tramadol, pharmacology, side effects, and serotonin syndrome: A review. Pain Physician 2015;18:395-400. Shakoor MT, Ayub S, Ahad A, Ayub Z. Transient serotonin syndrome caused by concurrent use of tramadol and selective serotonin reuptake inhibitor. Am J Case Rep 2014;15:562-4. Schaffer CB, Nordahl TE, Schaffer LC, Howe J. Mood-elevating effects of opioid analgesics in patients with bipolar disorder. J Neuropsychiatry Clin Neurosci 2007;19:449-52. Burkhart C, Morrell D, Goldsmith L: Farmacología dermatológica. In: Brunton LL, Chabner BA, Knollmann BC (editors). Goodman y Gilman. Las bases farmacológicas de la terapéutica. Mc Graw Hill interamericana, México. 12th edition. 2012; 1803-32. Vidal MA, Calderón E, Román D, Perez-Bustamante F, Torres LM. Capsaicina tópica en el tratamiento del dolor neuropático. Rev Soc Esp Dolor 2004;11;306-18. Cordero JEM. Electroterapia de baja frecuencia en Agentes físicos terapéuticos. Cordero JEM (editor) Editorial Ciencias Médicas, La Habana: ECIMED 2008:300-22. 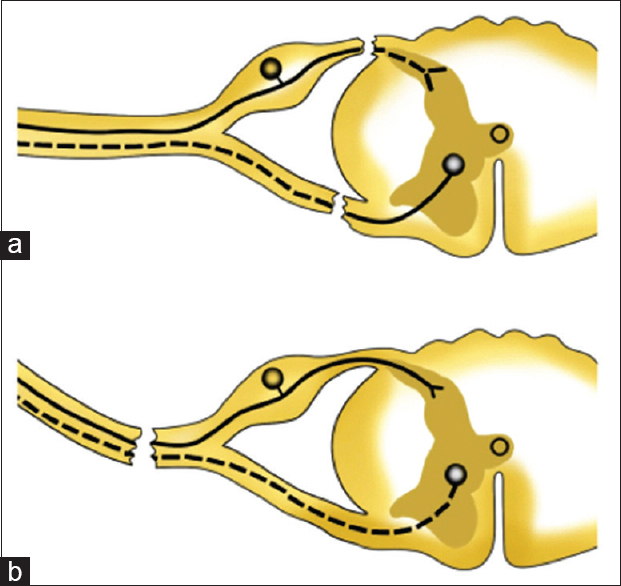 Baruah S, Devi BI, Bhat DI, Shukla D. Drezotomy in the management of post brachial plexus injury neuropathic pain: Preliminary results. Indian J Neurotrauma 2014;11:27-9. Raslan AM, Burchiel KJ: Neurosurgical approaches to pain management. In: Benzon H, Rathmell J, Wu CL, Turk D, Argoff C, Hurley R (editors). Practical management of Pain. Elsevier, Philadelphia. 5th edition 2014; 22;328-34. Stevanato G, Devigili G, Eleopra R, Fontana P, Lettieri C, Baracco C, et al. Chronic post-traumatic neuropathic pain of brachial plexus and upper limb: A new technique of peripheral nerve stimulation. Neurosurg Review 2014;37:473-9. Eisenberg E, Waisbrod H, Gerbershagen HU. Long-term peripheral nerve stimulation for painful nerve injuries. Clin J Pain 2004;20:143-6. Deer TR, Levy RM, Rosenfeld EL. Prospective clinical study of a new implantable peripheral nerve stimulation device to treat chronic pain. Clin J Pain 2010;26:359-72. Deogaonkar M, Slavin KV. Peripheral nerve/field stimulation for neuropathic pain. Neurosurg Clin North Am 2014;25:1-10. Robaina FJ. Aspectos neuroquirúrgicos del tratamiento del dolor crónico en el tercer milenio. Las unidades multidisciplinarias de dolor. Rev Soc Esp Dolor 2003;10:481-507. Isagulyan ED, Tomsky AA, Dekopov AV, Salova EM, Troshina EM, Dorokhov EV. Results of motor cortex stimulation in the treatment of chronic pain syndromes. Zh Vopr Neirokhir Im N Burdenko 2015;79:46-60. Pereira EAC, Aziz TZ. Neuropathic pain and deep brain stimulation. Neurotherapeutics 2014;11:496-507. Krames ES, Penhollow T. an overview of the rational use of intrathecal analgesic therapies en Surgical Management of Pain. Burchiel KJ (ed). Thieme, New York. 2° edición. 2015. Cap 38:393-407.